Realizing an FM network in SFN has always been a challenge for broadcasters. IsoWave is the new digital solution for synchronized FM emissions (Isofrequency – Isomodulation – SFN) allowing enormously better results respect to the ones obtained with other previous implementations. For the IsoWave solution an international patent application has been filed. This is what WaveArt and ABE have done, solving the problems of many FM networks by allowing the use of FM Isofrequency technology with outstanding results (in the order of 10dB protection ratio improvement compared to the results reported in the ITU Recommendation BS.412-9). - Unstable latency of the backhauling links feeding the Isofrequency FM transmitters (made adding timestamp and network delay information to the digital uncompressed MPX data). In this way it is possible to use also satellite and/or IP links. - Perfect reconstruction of each FM modulated signal, made with digital technologies, to have EXACTLY the same footprint for all Isofrequency emissions and so allowing the highest benefits. - Ease of setting of delay of the Isofrequency emissions since only the distance/delay between transmitting positions and interfered area has to be considered. - Advanced GPS+GLONASS based network synchronization system employing proprietary algorithms to avoid instability and long term de-synchronization. - Additional “side-benefit” employing digital MPX backhauling links instead of the usual analog MPX microwave links with all the related problems (frequency overcrowding, noise, degradation of the C/N ratio and stereo separation, etc.). Even those who use digital satellite links for backhauling have benefits using digital MPX since there is no degradation due to compression and decompression of the audio channels, to overshoots (again due to compression/decompression, which cause unwanted peaks of modulation often “out of mask"), etc. To enable synchronization, it is necessary to use a WAVE SYNC - digital MPX generator. The output stream is encapsulated in a MPEG Transport Stream - ASI and/or Ethernet interface. WAVE SYNC inserts a Time Stamp in the Transport Stream to enable synchronization of the transmitters. A network delay is set to compensate the latency of the backhauling. WAVE SYNC has multiple inputs: analog mono/stereo , MPX, AES/EBU, AES192, micro-SD slot, IP. It can also have a satellite/terrestrial receiver and an FM receiver on board. Also available are the stereo coder, the RDS coder, the advanced "soft clipper" and the automatic switch between 3 inputs. WAVE SYNC can also integrate a GPS/GLONASS receiver to generate the time and frequency reference. 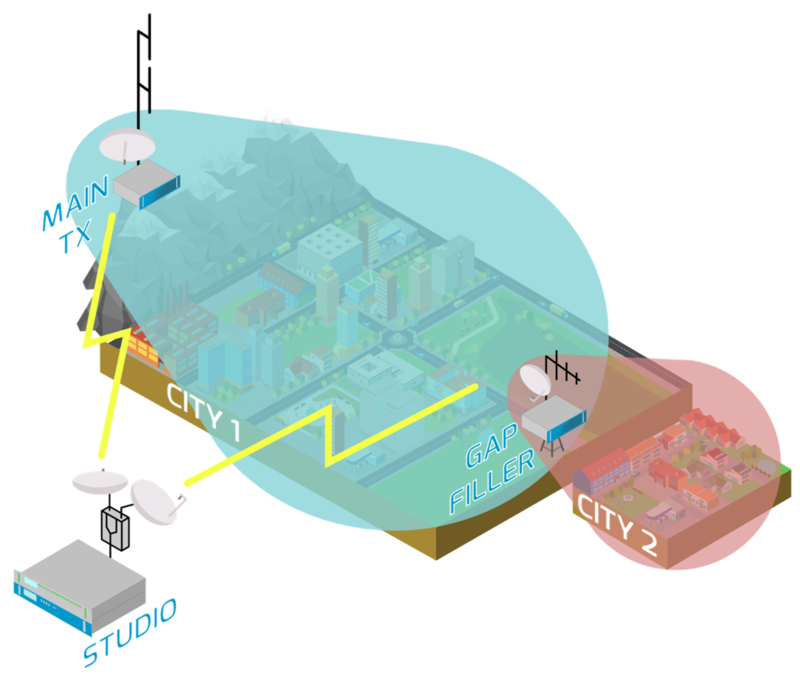 The transfer of digital MPX to all the transmitters operating in isofrequency can be relized via digital microwave links, satellite uplinks or fiber networks. WaveArt transmitters operating in SFN can receive the digital MPX via ASI and/or Ethernet, as well as directly with Satellite/terrestrial receiver. In case something goes wrong, the transmitters can automatically switch on one of the many available inputs (in this mode the synchronization is not guaranteed).